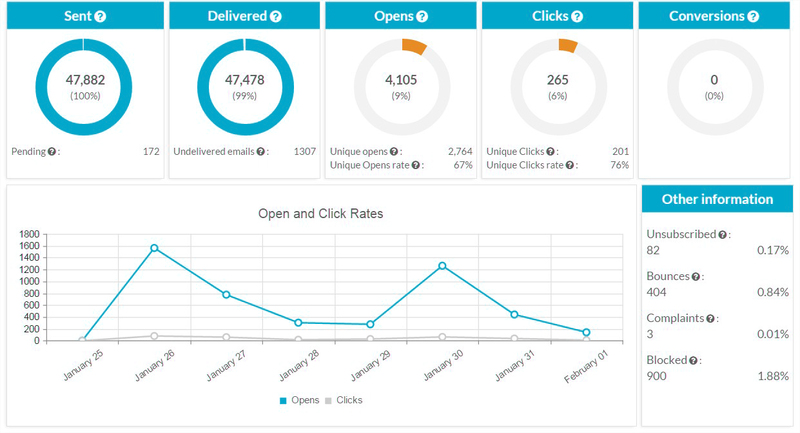 After having sent your email campaign, you can analyze your performances on the statistics dashboard. Keep in mind that the results of your email campaigns are updated every 15 minutes. You will then access to the global statistics of your account – there you can see the results of all email campaigns, sent during the current month. If you don’t see any results, check the diplayed period (it might be that your last email campaign was sent during the last month). Opens – the number of recipients who opened your message. However, be aware that opening a message in email marketing means that the recipient displayed (or downloaded) the images in the email (Gmail automatically displays the images in your main inbox, but other email clients might ask the recipient to click on a “show images button”). This is thow our software tracks the recipients that opened an email) . If a person opens the message, but doesn’t display the images, he won’t becounted as an opener. Complaints – indicates the recipients who received your message and then clicked on the option “Report this email as spam”. The complaint rate is a very important figure. When the complaint rate exceeds 0.2%, ISPs (Internet Service Provider) block your sender address and our servers. A high complaint rate indicates that the contacts on the mailing list didn’t agree to receive your massege. Blocked - indicates the recipients who didn’t receive your message because of a temporary blockage of their email provider (ex. Gmail, Hotmail, Yahoo, etc.). *Feature available with all premium subscription plans. Use the search filters for defining the statistics period and click on FILTER. Scroll down the Global Statistics page and in the table of your Email Campaigns click on one of the campaigns that you’ve sent. You will arrive on a page with the metrics of the selected email campaign. With a premium subscription plan you can also export these email IDs (click on the EXPORT button).